The USDA Good Agricultural Practices audit requires that certain activities on the farm be documented. These logs should accurately reflect what you have done on the farm to ensure food safety. If you do not write your activities down the auditor will assume that the activity never happened. This documentation may be new for many growers, so making it as easy as possible for you to comply will ensure that the documenting happens in a manner that is acceptable to an auditor. This is the eighth article in a series dedicated to preparing a farm food safety plan. Remember you may not need a third party audit; it depends on who is purchasing your produce. However, everyone should have a food safety plan. If corrective measures were needed briefly describe them. Calibration can be easily done. Using the ice water method, fill a large glass with finely crushed ice. Add clean tap water to the top of the ice and stir well. Immerse the food thermometer stem a minimum of 2 inches into the mixture, touching neither the sides nor the bottom of the glass. Wait a minimum of 30 seconds before adjusting. (For ease in handling, the stem of the food thermometer can be placed through the clip section of the stem sheath and, holding the sheath horizontally, lowered into the water.) 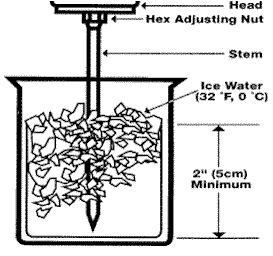 Without removing the stem from the ice, hold the adjusting nut under the head of the thermometer with a suitable tool and turn the head so the pointer reads 32 °F. If a digital thermometer is used it can be checked in the same way. If the digital thermometer is not reading correctly check the instruction for adjustments or replace. If the trailer is refrigerated what is the temperature. Additional produce on the truck, if applicable.